We are pleased to invite you to this year’s ‘Memories and Memorabilia’ day. Please come and help us celebrate and don’t forget that we are eager to speak with people who want to share their own memories of the building! We welcome messages from anyone willing to get involved in helping to organise the event. Contact fofmrb@googlemail.com. 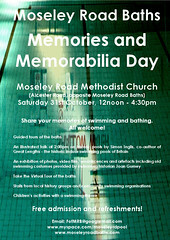 The Friends of Moseley Road Baths (FofMRB) group is staging its second Memories and Memorabilia day to celebrate the 102nd birthday of Moseley Road Baths, one of Britain’s most historic and architecturally significant swimming baths. A 1hr illustrated talk (starting at 2:00pm) on historic pools by Birmingham-born Simon Inglis, co-author of the recent English Heritage book, Great Lengths – the historic indoor swimming pools of Britain. An exhibition of photos, video film, reminiscences and artefacts including old swimming costumes provided by swimming historian Joan Gurney. Guided tours of the baths building, (including the Gala Pool and ‘slipper’ baths) at 12:30 and 15:30. A trip on the Virtual Tour of the baths. Activities for children with a swimming theme. Stalls from local history groups and community swimming organisations. Visitors will be encouraged to recount (and record) their own memories and bring along their own memorabilia for use in the three-year Pool of Memories project, for which the FofMRB recently submitted a bid to the Heritage Lottery Fund. Pingback: 2 days to go!